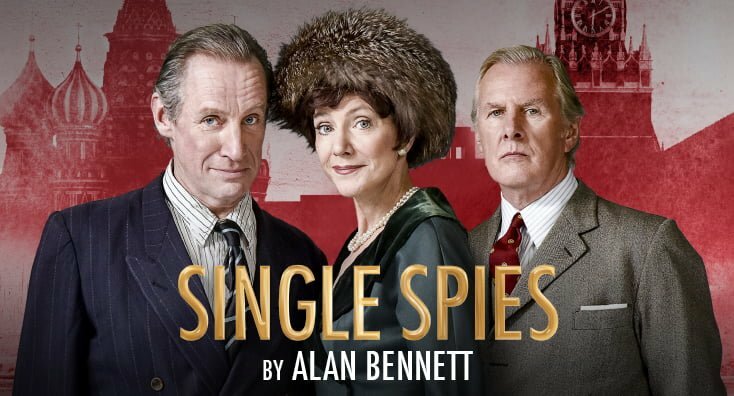 Single Spies is the collective name for two separate one-act plays, ‘An Englishman Abroad’ and ‘A Question Of Attribution’, when performed together as a double bill. The former relates a meeting between so-called ‘Cambridge Spy’ Guy Burgess and Australian actress Coral Browne in Moscow in 1958, a time when Burgess’s isolation had led to alcoholism and longings for home. The latter focuses on fellow spy Anthony Blunt during his time as the Queen’s art advisor and through his regular debriefings with MI5 in exchange for immunity from prosecution. This is not one of the strongest works in the Bennett canon. In part this is due to the wholly unworthy protagonists for whom it is impossible to feel any sympathy whatsoever. The programme notes quote Bennett saying that it is the subject of exile rather than espionage which sparked his interest. That may be the case, but the problem is that whatever anguish Burgess and Blunt may have felt, it is hard to shake the feeling that it was not even the least they deserved for their treachery. This was a hurdle the play never overcame. There is nowhere to go when one doesn’t care about the protagonists. In turn, it meant the play lacked Bennett’s usual warmth. An Englishman Abroad, is, I think it’s fair to say, a play in which very little actually happens. Coral Browne inexplicably takes it upon herself to help Burgess obtain clothes from England and takes wholly disproportionate umbrage when the shop refuses to honour the old spy’s account. Running at just 45 minutes, there was insufficient depth to compensate for the lack of plot. It is one thing to disagree with a writers’ point, but quite another be left with no real idea what the point was. A Question of Attribution started strongly with Blunt and his MI5 examiner dancing around questions in a most British of interrogations. This scene, at least, gave the author’s peerless ear for dialogue a chance to shine. However, the pacing suffered badly from an overly-long middle section which descended into little more than an art-history lesson. By the time the point was got to – art forgery as a metaphor for treachery – it felt heavy-handed and my attention had been long-since lost. In terms of the production itself, the cast did a reasonable job with what they had. An honourable mention to Nicholas Farrell who shone as both Beleaguered Burgess and gentle but wily MI5 interrogator, Chubb. Everything watchable about this play involved him. The rest performed their roles adequately but brought nothing particularly memorable. The sets were simple but effective but likewise didn’t take us anywhere we didn’t expect to go. I realise that the analysis of the actual performance is brief. This is because there simply isn’t much to say. They performed it ‘ok’, came out and said the lines in the right order, but there were no ‘wow’ moments or foyer talking points. Even as a huge fan of Alan Bennett, in this instance I felt that his beautiful grasp of language was insufficient to mask a lack of drama. Overall, a three star performance of a two star play. Reviewed by Paul Barrow at Leeds Grand Theatre on 12th April. For information about where the play will be touring, click here.